Touching base with a hurricane survivor can be both grizzly and great. 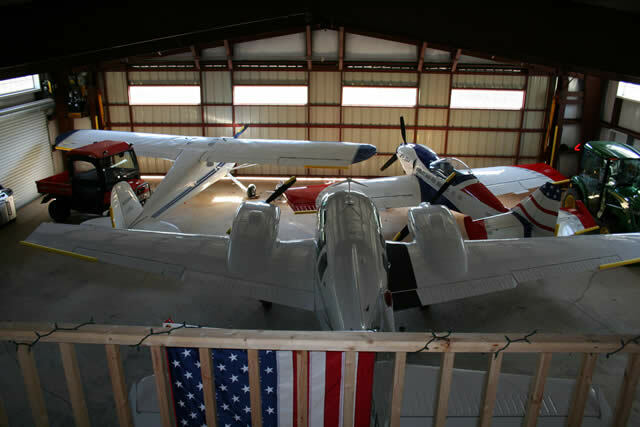 Aerobatic pilot Johnny Smith, Lucedale, Mississippi and his young family were survivors, as were his airplanes, thanks to their new hangar home built to withstand 90 mile per hour winds, in fact even the 125 mile-per-hour blast of Hurricane Katrina. Smith shares some of his comments, and his appreciation for building a 'hangar home' tough enough to come out a winner, even against Katrina. "As many pilots will tell you, the ultimate dream of a pilot is to live on an airport with their airplane. That was especially my dream since I am involved in aerobatics and sport aviation and next to my family, flying is the heart and soul of my life," says Smith, age 41, who soloed a Weedhopper ultra light when he was 12 years old. "After years of hard work, my dream finally came true. Our Sport Aviation operation outside Lucedale needed a new base. We spent 18 months building our own runway/airport, Cedar Creek Air Ranch, (FAA id MS26). My wife (a Lieutenant, U.S. Navy Reserve) was deployed to Iraq. So while she was overseas, we built our new hangar, this one large enough for my three airplanes (a Cessna 337, Glasair and a Zlin 50LS) plus living quarters for my family. "We finished in August 2005, just a few days before Hurricane Katrina came roaring through the country. I used a local architect and builder to help with the construction. 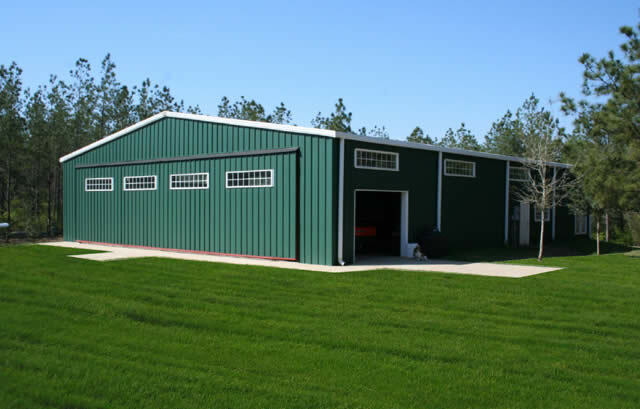 Our hangar home is a Gulf States steel framed, 60' x 80' x 14' building with a 12' x 50' Schweiss Hydraulic Door out front. And after Katrina roared through, I was ever so grateful for going the route of quality, especially in that big Schweiss door. "Our hangar home was exposed to winds of 125-mph for several hours. Yet that huge door did not fail. As a matter of fact, it survived without a scratch. But a near-by wooden hangar housing my Cessna 337 was totally destroyed, with parts of that airplane and hangar strewn over a half mile away. My two other planes rode the storm out safe and sound in the new hangar. "We're about done cleaning up around here. Thankfully our hangar home has really become the nerve center of our entire operation. My little daughters were small when the storm hit but remember the destruction so well. It's just an amazing sight to see trees falling debris blowing past your front window. We were on the inside looking out, and when the storm finally subsided, both my family and my airplanes were okay. "My oldest daughter, Aerial-Grace, now 5, often comments that she loves our hangar house because it is 'very strong.' My daughters feel very safe here because we had zero damage when others lost their homes. We've talked about getting a second place 'out west'. I asked the girls what kind of a house they'd want and they both say, 'Daddy, a hangar house just like this one.' To me that means everything because this is where their childhood memories will always be." "It makes me very happy to watch them pedal their pedal-planes around the hangar, no matter the weather. And of course it would be my special joy to see my little girls someday become fourth generation pilots in the Smith family. Heck, with a dad who's a flight instructor and airplanes parked on the other side of the kitchen door it couldn't be more convenient." Smith's grandfather started in the aviation business back in the 1940s. Over the years his planes included several Stearmans, a couple of Swifts, Bonanzas, TravelAirs, Pipers and others. He put in the first grass strip in Lucedale. His father and uncle are pilots and work with Johnny in his sports aviation business today. Wanting his hangar home to look like something other than an ordinary hangar required some 'special design work' for that big 50-foot wide hangar door. Here's where the 'custom creativity' of Schweiss Doors came to the rescue. Smith ordered his Schweiss door with four, 2-foot by 8-foot window jambs positioned in the top portion of the door. "That's one of the things I really appreciate about the Schweiss operation. Tell them what you want and they custom build [your door] exactly to the specs you need. With these four horizontal windows, our hangar home looks like a giant garage door and definitely gives a better visual impression, plus of course, lots of free energy lighting during the daylight hours." Johnny's wife, Ginger, though not yet a licensed pilot, has a keen appreciation for that big door too, especially the remote control feature. "When we've been out flying and come taxing up to our hangar home, we just hit the remote button and taxi right into the hangar. Often our daughters are asleep in the airplane. We each pick up a child and walk just a few feet into our home right there in the hangar. 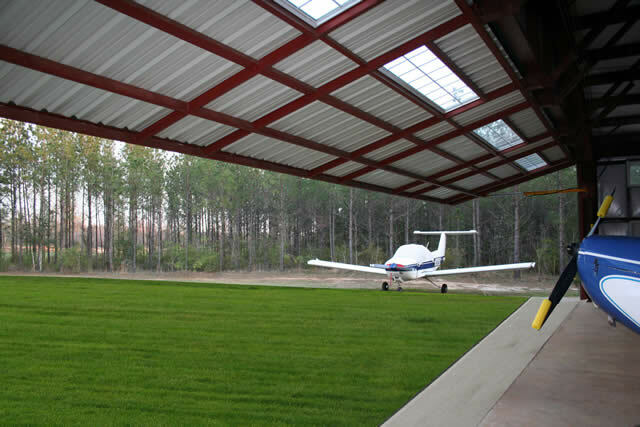 For a flying family like us, a hangar home really is a tremendously convenient way to live," related Ginger. Her intentions of becoming a pilot detoured somewhat when she fell in love with her flight instructor, Johnny Smith. But the aviation history continues through the names of their two daughters, Aerial-Grace, and Skyler Rose, 3. Already both Mom and Dad are predicting both daughters will also be pilots. "At this rate, they may get their license before I do," laughs Ginger. Editor's note: Smith, age 41, has a very unique biography. His BS degree was earned at the University of Southern Mississippi but he also has an MD degree from the University of Mississippi School of Medicine. He comes from a 'blue collar' background but worked his way through college while also completing his flight ratings up through flight instructor. While in college he developed an interest in medicine and again worked his way through medical school. Preferring the patient contact of primary medicine care, he went through a Family Medicine residency and then chose to work in emergency medicine. While in medical school, he paid some of his expenses by giving flight instruction to fellow students. He emphasizes that he is "a pilot who became a doctor," not "a doctor who became a pilot." Although aerobatic airshows are the main focus of his company, they also do specialized flight training (aerobatic, experimental, tail wheel, ultra light and BFRs) plus experimental flight testing, aircraft ferrying, as well as aircrafts sales.